I was very excited waiting for this film to come out. How could I not be? I saw the original trailer three times before I sat down in the theater, and it made me jump at the end every time! And apparently another trailer was so scary, it was taken off YouTube (I wish I’d seen it before it got taken down, but that’s life). So you could see why I was interested in going to see it, and why I hoped it wouldn’t be terrible. I’m glad to say, for the most part, The Nun lives up to the hype. 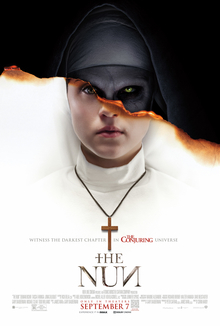 The Nun follows Father Burke, a priest who investigates paranormal and strange events on behalf of the church, and Sister Irene, a young novitiate with a history of fantastic visions. They are sent by the Vatican to investigate the suicide of a nun at a convent in Romania, and while there face an ancient evil that is seeking to escape the abbey and to wreak havoc on the wider world. First off, the best part of this film is its characters and the actors playing them. Although they’re not the most developed, they feel like real people you might know and even want to hang out with. Sister Irene, played by Taissa Farmiga (the main series’ star Vera Farmiga’s younger sister, if you can believe it), is a loving, down-to-Earth woman who is trying to figure out whether to become a full nun. Frenchie, a young man who helps Father Burke and Sister Irene out, is wonderful comic relief as he flirts with Sister Irene and asks the occasional stupid question. And the Nun…yeah, that monster is still freaky as it was in the Conjuring 2. No wonder a film centering on it got made. I also love the set of this film, a castle which is like a cross between Hogwarts’s darker sides and some castles in Europe I myself have been to. It’s so creepy and decrepit,, and is made to look almost like a maze you could get lost in. Add in all the touches–like the hundred thousand crosses placed throughout the castle–and it adds the perfect touch. And, as always, there’s a strong atmosphere in this movie, just as we’ve come to expect from the Conjuring franchise. It keeps you tense and, coupled with some good jump scares (including that one from the trailer, which still got me) and a decent plot, keeps you interested and even a little scared throughout the movie. Still, The Nun isn’t perfect. While the plot is decent, you can kind of guess where things are going to go about sixty-percent of the time, with the other forty-percent just being minor touches like a twist with the hauntings or something the demon does that you don’t expect. That, and the film may over-rely on jumpscares. This is a criticism that many people have had about the Conjuring films, but this is really the first time it bothered me. It might’ve been better if maybe the film relied more on creeping terror and a few more twists rather than making me jump in my seat. Still, The Nun is a great addition to the Conjuring series and a good sign that there’s still plenty to mine from the lives of Ed and Lorraine Warren. On a scale of 1 to 5, I’m giving the film a 3.8. It’s not perfect, but it’s got a lot going for it and I’m glad I went to go see it. Take a look, and pray for safety…and that the next Annabelle film is good. Yes, there’s another Annabelle film on the way. It’s going to be released next summer, and it looks like it might be the last Annabelle film, dealing with the titular doll and the Warrens’ daughter. Obviously, I’m looking forward to it.